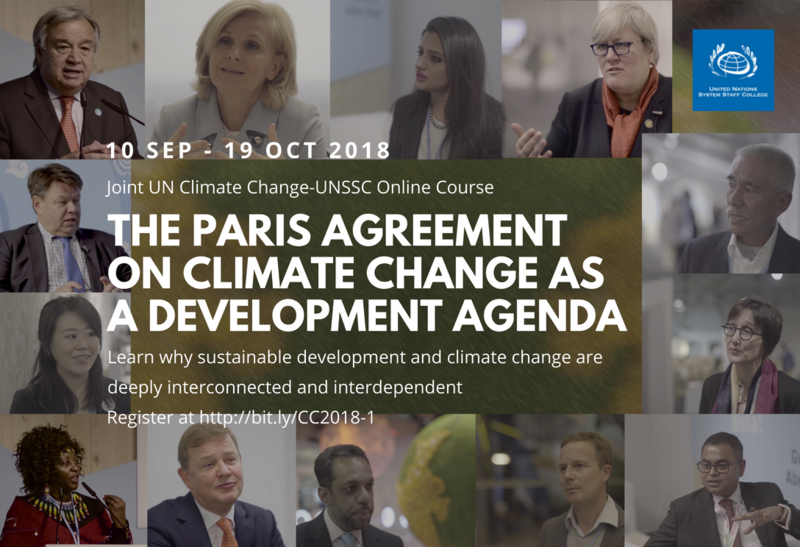 The UNSSC Knowledge Centre for Sustainable Development is now accepting registrations for the upcoming online course The Paris Agreement on Climate Change as a Development Agenda which will run from 10 September to 19 October 2018. This six-week joint UN Climate Change–UNSSC online course offers a holistic and integrated approach to climate change. It demonstrates the interlinkages and interdependencies between sustainable development and climate change to make informed policy choices towards low-carbon and climate resilient sustainable development. The course will frame climate change impact and action around five core cornerstones of the 2030 Agenda: People, Planet, Prosperity, Peace, and Partnership. Week 6: Partnerships and Means of Implementation for Climate Action (Partnership). explain existing tools and instruments to mainstream sustainable development and climate action into national development policies and planning. The online courses combines tutored components with synchronous and asynchronous activities, comprising knowledge acquisition, knowledge application to real-life and training scenarios, as well as group work and collaboration with peers. In addition to engaging in self-paced learning, participants in UNSSC online courses also benefit from live webinars with renowned experts from the UN the private sector and academia, allowing real-time virtual interaction between the instructors and participants. For more information and to register, please go to http://bit.ly/CC2018-1 Deadline for registration is 03 September 2018. Should you have questions, please email sustainable-development@unssc.org.